Traditionally temporal bone fractures have been classified into two main categories based on the fracture plane relative to the long axis of the petrous bone, and were either considered longitudinal or transverse fractures. 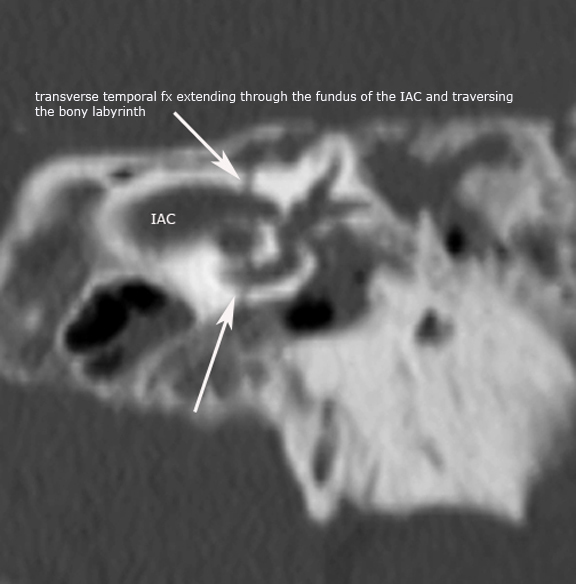 However, given the more sophisticated technology associated with multi-slice CT scanners it has become readily apparent and recognized that many temporal bone fractures have mixed features of both. 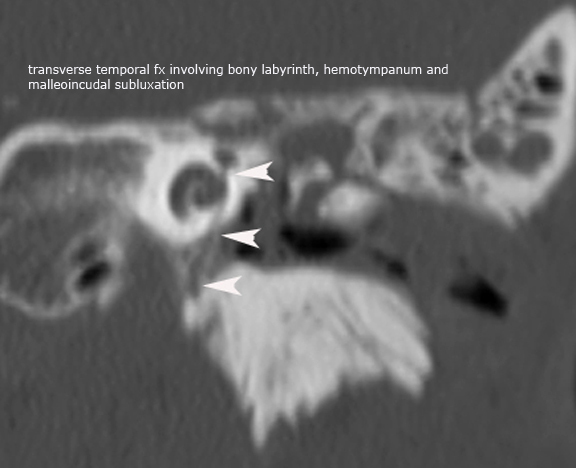 As a result, it now widely recognized and common to see complex or mixed-type temporal bone fractures which have both longitudinal and transverse features. 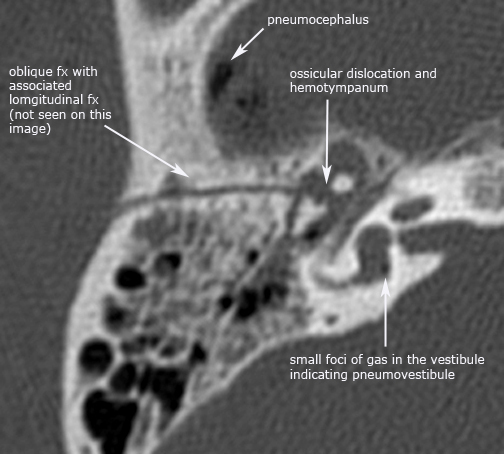 Classically the longitudinal temporal bone fracture runs parallel to the long axis of the petrous bone, and typically traverses the middle ear cavity with involvement of the ossicles resulting in conductive hearing loss. The fracture plane usually is extra-labyrinth and occurs more commonly anterior to the labyrinthine structures towards the eustachian tube and middle cranial fossa, and less commonly posteriorly relative to the labyrinthine structures towards the jugular foramen and posterior fossa. 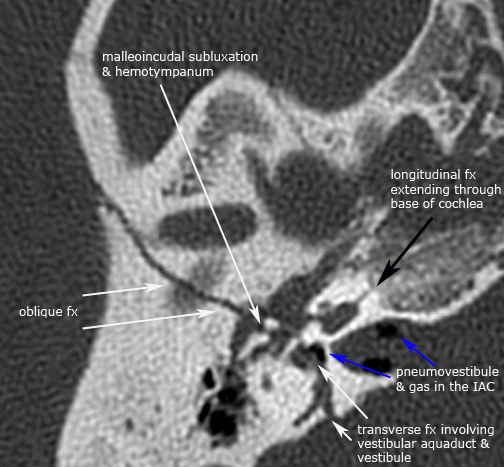 Additional involvement of the EAC, tegmen tympani and squamosal temporal bone is common. 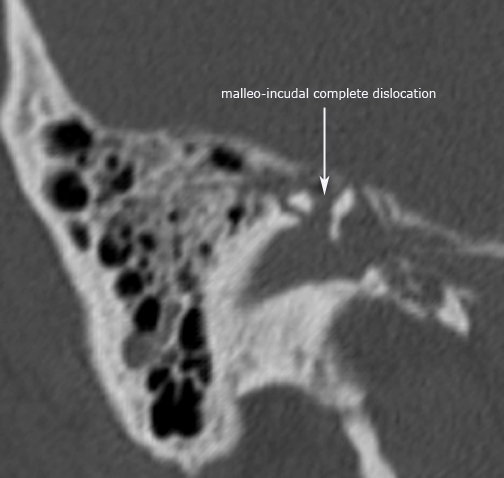 Both subtypes of the longitudinal temporal bone fractures frequently involve the first genu or anterior tympanic segment of the facial nerve and involvement of the mastoid segment can be seen with the posterior subtype. A rare complication that can occur with the anterior longitudinal sub-type is an epidural hematoma in the middle cranial fossa as a result of vascular injury to the middle meningeal artery. 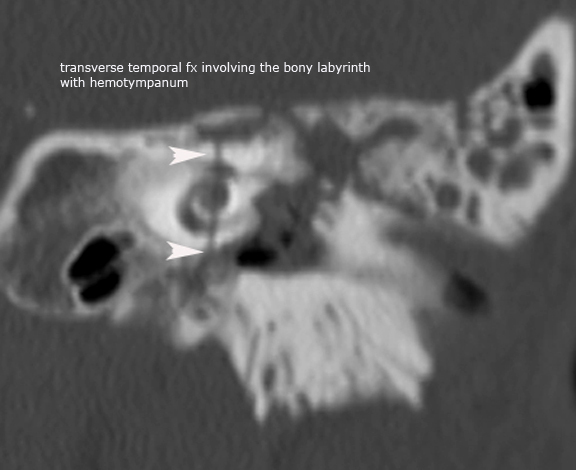 The transverse temporal bone fracture runs perpendicular to the long axis of the petrous bone. 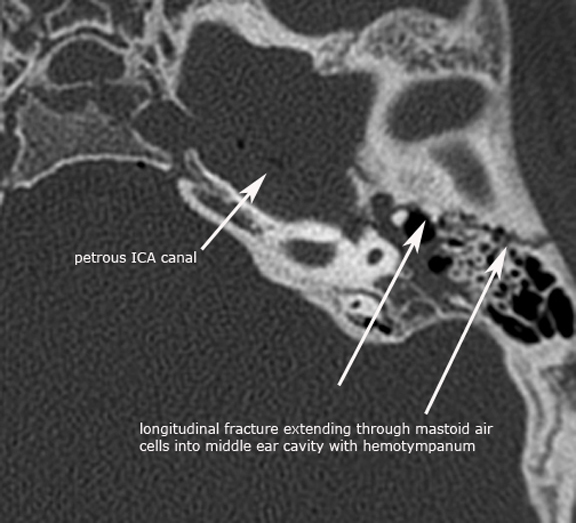 The fracture plane typically extends from the jugular foramen and foramen magnum to the middle cranial fossa, commonly passing through or near the vestibular aquaduct with variable involvement of the otic capsule. 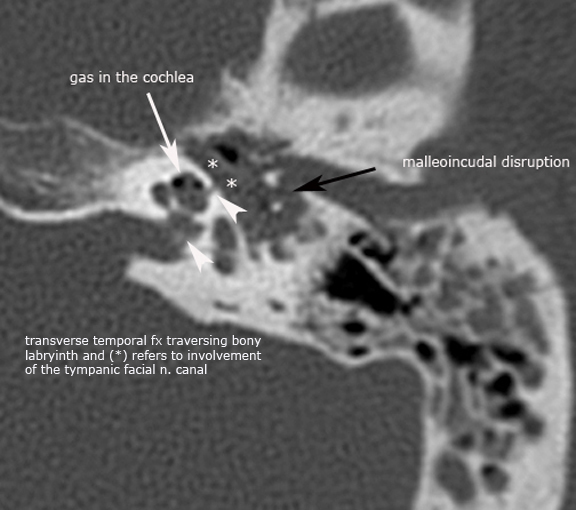 There are two sub-types of transverse temporal bone fractures relative to the arcuate eminence, medial and lateral transverse fractures, both of which frequently result in sensorineural hearing loss (SNHL). 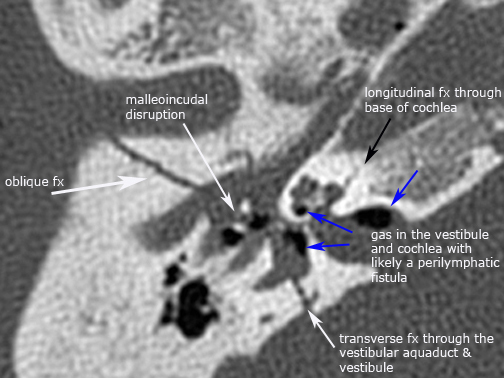 The medial sub-type traverses the fundus of the IAC and SNHL is variabe but can be complete due to transection of the cochlear nerve. The lateral sub-type traverses the bony labyrinth resulting in SNHL and may also have an associated perilymphatic fistula due to stapes footplate injury. 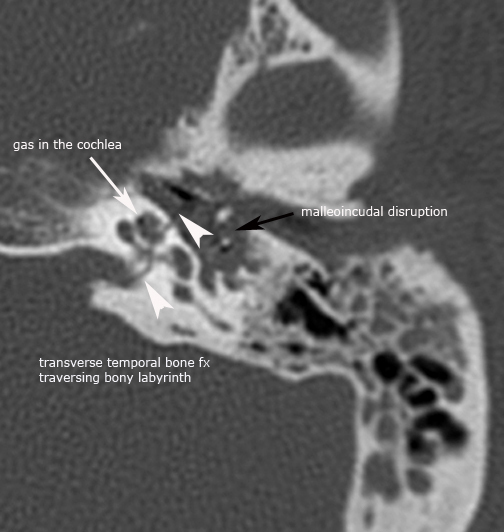 The most common complication associated with temporal bone fractures is ossicular injury resulting in variable hearing loss. 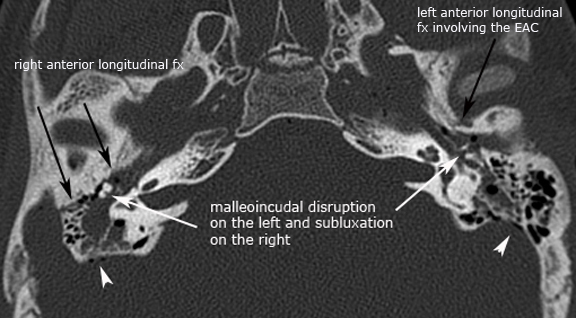 Due to the anatomy and supportive ligamentous structures stabilizing the malleus and stapes, the incus is the most vulnerable to injury and as a result most ossicular dislocations or subluxations involve the incus. The most common injuries seen are incudostapedial joint subluxation, malleoincudal subluxation, incus dislocation and dislocation of the malleoincudal complex. Less common ossicular injuries include stapedial and mallear fractures. 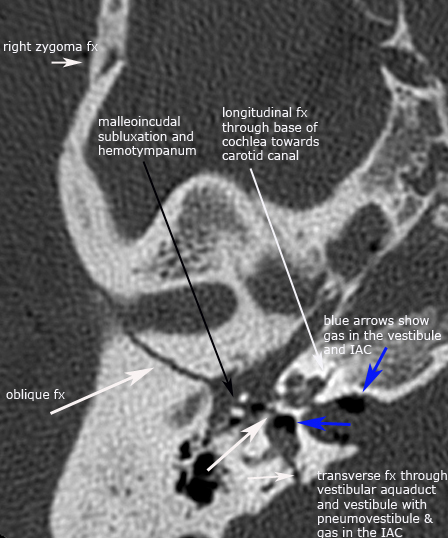 Other complications related to temporal bone fractures include facial nerve injury, perilymphatic fistula, vertigo, CSF leak, meningitis and aquired cholesteatomas.